Beautifully engraved specimen certificate from the Horizon Organic Holding Corporation. This historic document was printed by the Security Columbiabn Banknote Company and has an ornate border around it with a vignette of the company's cow logo. This item has the printed signatures of the Company's officers. 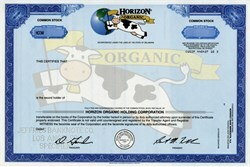 Horizon Organic Holding Corporation operates a dairy that provides fluid milk and more than 60 dairy products produced with raw milk from organically raised dairy cows. Horizon's products include yogurt, butter, cheese, and sour cream as well as eggs and fruit juices. Milk products include nonfat, low-fat, reduced fat, and whole milk, low-fat chocolate milk, and cream. Horizon products can be found in natural foods markets, conventional supermarkets, and health food stores in all 50 states. The criteria for organic dairy certification involves the nourishment and treatment of dairy cattle. A cow is certified for organic milk production after feeding on organic feed for one year; chemical pesticides, herbicides, fungicides, or fertilizers cannot be used for growing animal feed for three years. For one year before certification the cows cannot be treated with antibiotics during sickness or with synthetic hormones to increase milk production. Restrictions for humane treatment include uncrowded pasture grazing and nighttime housing in barns. Organic certification requires that organic milk not be mixed or come into contact with conventional milk. Horizon's organic dairy farms produce about half of the company's supply of raw milk and more than 200 independent dairy farmers provide the balance.